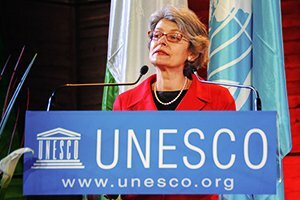 After the US State Department announced the withdrawal of its membership from the United Nations Educational, Scientific and Cultural Organization (UNESCO), UNESCO’s director-general, Irina Bokova, expressed “profound regret” over the decision in a public statement afterward, calling the decision a “loss for multilateralism.” Apparently, multilateralism has joined its sacrosanct kin, diversity and multiculturalism, as a highly-evolved virtue, independent of circumstances. If multilateralism has suffered a loss, the world must mourn, period. Not that Bokova is incorrect, multilateralism suffered at UNESCO last week when the US announced its decision to withdraw, but why is this bad? Simply put, “Multilateralism is [a] diplomatic term that refers to cooperation among several nations.” By withdrawing its support for the ongoing hypocrisy towards Israel at UNESCO, the US refused to cooperate. It’s true that, as president, Barak Obama “made multilateralism a central element of U.S. foreign policy.” Good for him. There is nothing wrong with cooperation, but should not context remain relevant? Multilateralism was well-served in striking the recent Iran Nuclear Deal, for example, but the world, as a result, is now virtually guaranteed to welcome a rogue nuclear power onto the international scene within the next ten years. Much more underlies the spurious negotiations with Iran than “cooperation for cooperation’s sake,” but the fact that most world leaders were on board with the disastrous accord went a long way to sell it to the American public. Cooperation at all costs? Demographic decline: European nations have low birth rates while Muslim nations do not. The unsustainability of the modern, Western social-democratic state, the policies of which, Steyn claims, erode individual self-reliance to a point at which a more resilient people, Muslims, in his opinion, will be able to take control. Finally, Steyn asserts that Europe will collapse from ‘wimpiness’ or ‘multicultural sensitivity,’ leading to the abandonment of Western core values. But America and the West have not so much abandoned their core values as they have replaced them with inane generalities like multilateralism. We may have fast-tracked Iran into a nuclear terror-state but, by gum, we did it cooperatively. And while UNESCO has become, as Israel Prime Minister Benyamin Netanyahu said, “a theater of the absurd,” the Trump administration is drawing fire from some circles for refusing to participate in the madness.